An easy week, partly because a had a slight cold from Sunday. It ran the usual course of my (infrequent) mini-colds — 2 days sore throat, 2 days runny nose, 2 days coughing. 11:30 - Weights and core at the gym. Cool and raining, so took a rest. 7:30pm - club 5,000m time trial. BUT, I ran 5,400m! I know I can't count 12-1/2 laps, but it seems that I can't even count 2-1/2 (I take my 1000m splits every 2-1/2 laps). The third 1000 split was 1,400. I don't know how I did that. For one thing, it's too dark to see my watch very well. Anyway, the splits were 3:58/3:58/5:29/4:03/4:00. 21:29, which would work out to 19:54. Not very good and slower than I expected. But I felt like I was going faster, which is not a good sign. I guess the cold affected me. Also, the humidity was about 100% - had been raining off and on all day and evening. 3:30 - 8.8k with 2k warmup/down and 200 x 4 x 4 at a track with the HS girls (the slower ones). All from 42 to 45 with 30sec. rest and 400 jog in between sets. No time to run, but also legs tired and sore. The TELL (Tokyo English Life Line) charity race, for which I am the race director. Nice day, good turnout, everyone had a nice time. Had over 500 runners, including 20 from the club, one from the track team (top boy, who placed 5th in the 5k in 17:05) and about 10 others from the team who served as volunteers. Too exhausted afterwards to run. 12:30 - weights and core at the gym. Out: 44:09 @5:31, In: 34:01 @4:21, although I stopped 200m short of home because my right hamstring started to hurt. I could feel it a little with one k to go, and then there was a slightly sharper pain, so I stopped. Not sure why that happened - residual damage from the 200 x 16 on thursday? 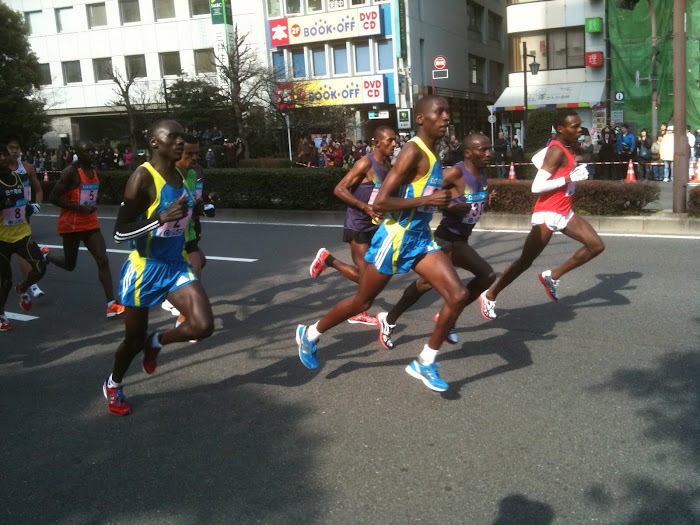 Sendai Half Marathon next Sunday. Hope to have a good run. Very impressive second 8 Km pace on Sunday. OK - I've been persuaded. Looks like you average two gym workouts per week which you've been doing forever. Obviously something in it. I'm assuming no more than 30 minutes? All the best for Sunday. Mark: I do weight machines for 20-30 minutes and core for 30 minutes. I think it's good to work the upper body a bit, and do a few leg exercises also, hamstrings, ab- and adductors.... And of course abs and lower back exercizes are good for runners - not sit-ups, leg lifts and planks. Yes, 200s will do that. Hope it's OK. Funny about the 5000. At least you can claim a lifetime PB for the rarely raced distance of 5,400m ;) I did that in a 10,000 once due to the lap scorer not counting my laps correctly. Did a lifetime PB for 10,400 of about 39:16.